This is the biscuit recipe I've been tweaking with the extraordinarily enthusiastic assistance of The Kid. The last few times we've made this, he's gone racing to his room to get his Ratatouille chef's hat and apron, which just adds to the adorable. He is so very proud of himself for making these biscuits, and I am grateful for his love of cooking and baking, which will hopefully stand him in good stead as he navigates his future with food allergies. Mix lemon juice and soy milk in a nonreactive measuring cup and set aside. Preheat oven to 450°F. 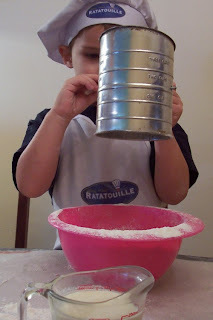 Sift together flour, baking powder, baking soda, and salt into a medium largish bowl. Cut the margarine into small pieces, then rub into flour mixture until nice and crumbly, but stop before the margarine begins to melt! Slowly pour lemon juice and soy milk into flour mixture and stir until combined. Stop now and evaluate your dough. It should be very sticky. If you are baking without assistance, continue. If there is a short person helping, I suggest adding a small amount of flour (no more than 1/4 C) until it becomes slightly more manageable. The resulting biscuits won't be quite as tender, but the amount of mess on and surrounding your child will be considerably less. Thoroughly dust hands and surface with flour and gently turn out the dough onto it. Lightly flour the dough, and press out to about one inch in thickness. Fold the dough in half, then repeat half a dozen times. Now gently pat out dough to anywhere between one half and one full inch, depending on your preference. Using the biscuit or cookie cutter of your choice, cut out biscuits and place in nonstick baking dish. Push the remaining scraps together to cut out the last few and add to pan. Bake for fifteen minutes or until tops turn golden brown. Serve while still hot. We like ours with margarine and honey or blueberry preserves, but they are always gone before I can get a picture! My husband has requested that I create an allergy safe sausage gravy to pour over them, so that should be coming soon. I am submitting our biscuits (with some trepidation, since I've seen the amazing dishes in previous ones) to Lore of Culinarty for the Original Recipes Round-Up. I love the heart shape! Great job, I bet these would be great for scones! I usually fall back on Bisquick, but these don't look to hard. 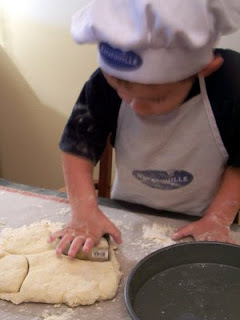 The biscuits are adorable and so is your little sous-chef :). They look delicious and the fact that they're eggless and dairy-free makes them even more valuable! 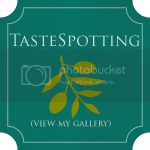 Oh girl, these look wonderful!! I can't wait to try them!! I love the hat! 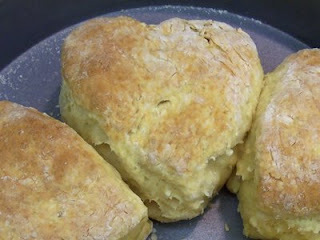 I learned a new way to make dairy-free biscuits that is a little outside the box but delicious...beef suet! I know it sounds crazy but the ones I had were wonderful! I think it is nice that you have your kids help, and those ratatuille chef hat and apron is super cute! I will try the recipe, I love biscuits! Did you ever come up with Allergy Safe Sausage Gravy? I would LOVE to try that! I just wanted to add that I have used both rice milk and almond milk in place of the soy milk and every time they turn out delicious! Almond milk really gives them better texture. :) I just thought this might help someone else out. I attempted a gluten free version of these twice and have come up with 2 different ways of not doing them gluten free. But they do make a delightful mock corn bread when you do them gluten free. The first time I just did it as written substituting an all-purpose GF flour. The second time I added some xantham gum as well. Made these this morning with almond milk instead of soy milk. Also substituted vinegar instead of the lemon juice. They were delicious! In my oven, they only took 12 minutes to brown. Thank you for your awesome recipes! 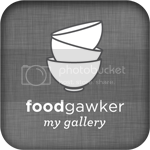 I am lactose intolerant and am always searching for recipes and changing recipes so that I can eat them! 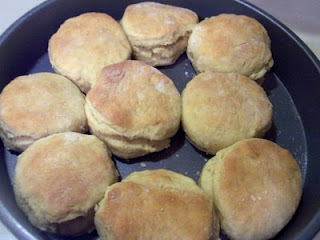 I made these biscuits this morning and they were delicious! I substituted almond milk instead of soy milk and used vinegar instead of lemon juice. They were moist and flaky! Thank you for your recipes. I am lactose intolerant and am always searching and changing up recipes in order for me to be able to eat them! Thanks again! These look delicious! I love the hearts! Perfect for Valentine's Day!